28 before 29, #7: Cathy W.
One evening this spring, I went to a writers’ group meeting at the Brooklyn home of Cathy Wasserman, an artist, social worker, and coach I’d met through my work at Idealist. Though I was only able to attend two meetings of the writers’ group before I moved, I tap into the memories often. The meetings were like mini-retreats, little oases in the midst of the NYC hustle-bustle, full of kind, supportive writers in a beautiful space. Cathy’s answers below make me feel close to those laughter-filled Brooklyn evenings all over again. Cathy: Oh, boy, maybe more than it should! Somehow I became familiar with the term around my 26th birthday. I seem to recall a friend telling me about it because that was a really tough year. Nothing like lots of endings and a health crisis to deliver one to the doorstep of massive transition! My friend told me about Saturn returns in an effort to cheer me up. She said something like, “Saturn returns around your 27th, 28th year so you’re ahead of the game. It’s kind of like you’re getting immunized now”. Oy, it didn’t exactly have the cheering effect she had hoped, but I decided to research the concept and sank into a few astrology books. I learned that Saturn returns is less an event than an intense process. It seems to mark a time in people’s lives where much ends, but before you’ve reached a point when new things have clearly begun. It’s a kind of pause before a whole new way of life begins, a ramping up period when it can feel like nothing is happening, except you’re swimming in some pretty treacherous molasses! For me, that was exactly, remarkably the case, and the transition involved a coming home to a new place to live, and what turned out to be an almost entirely different way of life—I moved from Boston to New York, macro to micro work and claimed my inner artist. C: At 28, I was working at Jacobi Hospital in a day treatment program, living in Park Slope, writing a thesis on the relationship between dreaming and writing poetry, studying acting, and knee deep in writing a book of poetry and embracing that lil’ old inner artist. I was in love. With New York City. I mean really in love. There was almost nothing the place could do wrong. I went to one movie after another, museum, cultural event, and walked from one end of this city to the other. Sounds great, right? Well, some of it was, but a lot of it was disorienting. I was in a new place without many of the familiar markers and people of my old life. 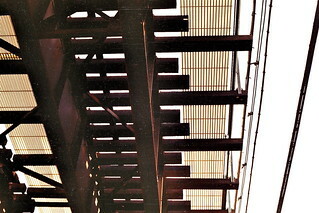 I was in training for a new career when I also knew that a huge part of my calling as an artist needed equal attention. Sometimes, I felt that molasses pull me under and, other times, I felt like the luckiest gal on, at least, the eastern seaboard! C: Strangely, I remember two seemingly simple things most about that year – the commute I made every morning from Brooklyn to the north Bronx, which took me almost 2 hours each way. Pity me, I had to arrive at work at 8 am! The commute was so exhausting, I would usually arrive home, do a bit of writing and then fall asleep. I felt ancient and there was something very appealing about being part of the working world that places demands on you. I also remember the acting class that I took. Inspired by Julian Beck to study acting as an act of social resistance (Ok, I wasn’t that ancient in my girlish attitudes! ), I was dedicated to attending class twice a week. The teacher would accept nothing less than total authenticity in every scene, and oy, it was not easy. Taken together, I realize both memories stuck because I was learning to really show up as an adult, no matter what. Sometimes, it was a bitter pill to swallow! C: At this point, I feel pretty far from these memories. Incredibly, it’s almost 15 years ago! But just talking about it, taps me right back into it. The feeling was/is of possibility, of finally, after so many years of feeling stuck in Boston, feeling a new sense of aliveness and experiencing alternating waves of joy and great fear around that. Knowing that I was on the cusp of not being so young anymore. That it was time to really settle into the choices that I was making, to stop letting freedom and possibility overwhelm me and to accept that some limits and structure could actually engender my full expression rather than curb it. C: I guess I would start off by saying that while Saturn returns intensively at around 28, my experience is that it’s an on-going process, a kind of prism through which much of one’s later experience is ‘angled’ and ‘colored’ because in some ways, Saturn returns yearly, monthly, weekly, and even moment by moment! For me, it’s really about being in touch with the depth of who we can be. That place between formation and realization. It’s an itchy place. A creative place. Very fertile. But not without it’s jagged rocks. If you can till that soil, take it, tolerate its edges, you’re in for a lot of growth and if you mostly resist it, you may be in for a whole lot of bumps. I’d add start by investigating and respecting the way that life undulates between pathos and joy. That as much as we want to control that undulation, we often can’t. Acknowledging that can actually be empowering because it can open up the way for us to be present for what is at the same time as we strive to create what will be with as much integrity and life force as possible. I’d also say don’t be afraid to get support, it ain’t easy at times! Talk about what you’re letting go of, what you feel like you’re bringing into being even when you may not quite be sure. Claim the question marks. They can be wonderfully enlivening when we start from the assumption that discovery is a thrilling process in and of itself. I’d also say don’t be afraid to talk to those of us who have been through it already, seek out mentors. Don’t be afraid to both cry and laugh out loud. Many a time in my own coming into adulthood process, I just had to smile at how rigid and intense and unforgiving of myself I could be. And by the way, that I can still be! Yes, perhaps, most of all, try to be gentle with yourself, allow yourself to find the path to kindness to who you are not, but want to be and revere who you are becoming. Thank you, Cathy! Reader-friends, the tagline for Cathy’s coaching business is “Chart Your Own Course.” If you think you could benefit from her coaching (I think we all could! ), visit her site, self-leadershipstrategies.com. 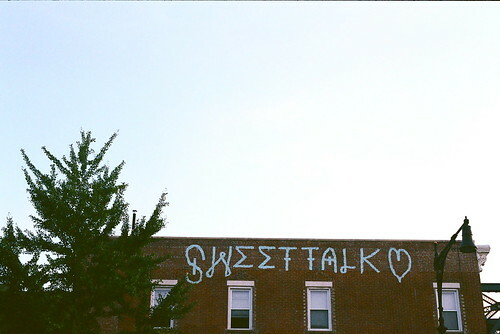 Photos by yours truly: Brooklyn “Sweet Talk” graffiti + Queens subway tracks, both from 2009. Previous “28 in 29″ posts: Intro; Hannah, #1; Kara, #2; Saya, #3; Cathy (aka Mom), #4; Rachel, #5; Jen, #6. This entry was posted in People, Projects and tagged 28 before 29, art, Brooklyn, NYC, process, saturn returns, work. Bookmark the permalink. ← 28 before 29, #6: Jen G.